The „Eurodrone“ is a project of the German, French and Italian governments, to which Spain later also joined. The drone can be equipped with both rockets and surveillance technology. The development is to be finally decided before the end of this year. Airbus is currently gathering experience with drones in various German projects. After years of tug-of-war, the Bundeswehr is stationing its long-range drones in Israel. The first German soldiers are now being trained in Israel, and the influx of aircraft will take place before the end of this year. The main contractor of the German-Israeli drone programme is also Airbus, which is responsible for the maintenance of the system in the operational area. Like the German soldiers, the Airbus technicians in Israel must therefore also be trained for the „Heron TP“, because after repair or maintenance, the drones are sent on a test flight in the operational area. These flights are controlled by Airbus personnel. 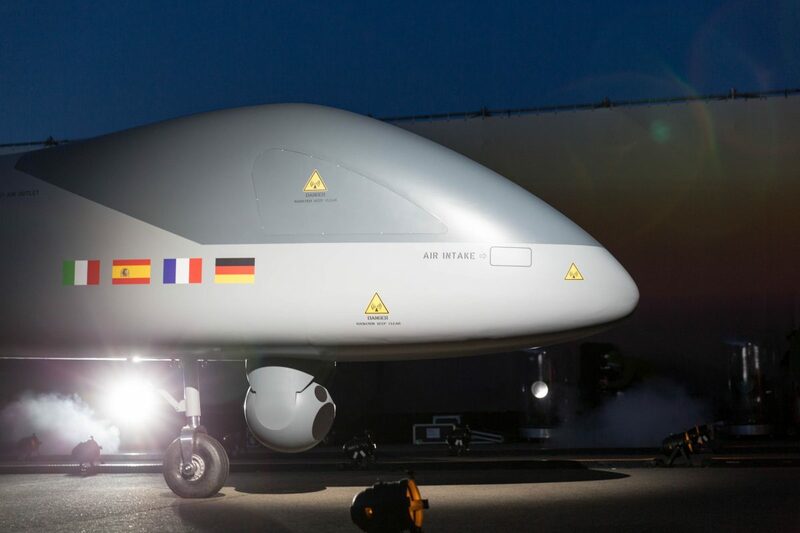 The Bundeswehr’s requirements for the „Eurodrone“ include day and night missions as well as „adverse weather conditions including predicted or reported moderate icing“. It will also operate on an equal footing with civil aviation. One of the urgent problems in the development of the „Eurodrone“ is therefore the installation of a „Detect and Avoid“ system, as required for all airspaces controlled by air traffic controllers. The German Armed Forces are working intensively on such a technology and have started a cooperation with the civilian German Aerospace Center. The Ministry of Defence does not want to determine whether a German alternative system can actually be installed in the „Eurodrone“. If no functioning European system can be developed by 2025, a decision could be made on „introducing American technology“. However, this was developed for US aviation regulations. According to a study by the Ministry of Defence, the „adoption of American standards for Europe“ is therefore also conceivable. The German government still assumes that the development of a „Eurodrone“ ready for series production will be completed by 2025. Until then, further governments will be sought to guarantee acceptance. The German Air Force intends to purchase seven systems (21 aircraft and 16 ground control stations), while the Spanish Air Force intends to purchase 15 systems. At the instigation of the German government, the „Eurodrohne“ was incorporated into the „Permanent Structured Cooperation“ (PESCO) as a joint EU armaments project. In this way, its subsequent operation will receive ten percent support from the European Defence Fund. In this way, governments are encouraged to launch a programme of armed drones. In addition to the four developing nations, the Czech Republic was the first government to announce its intention to join the PESCO project. Presentation of the „Eurodrone“ as a mock up at the ILA 2018 in Berlin (Airbus).